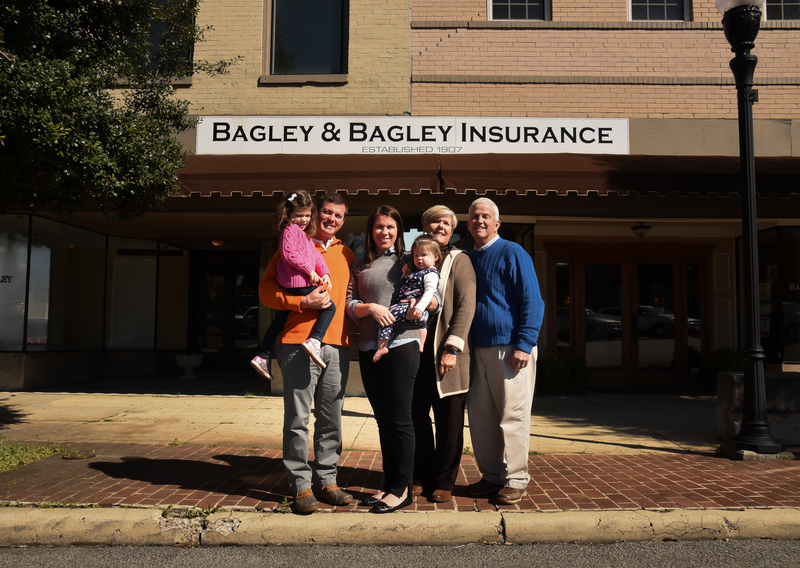 When Owen Bagley stood in the bay windows of his father’s insurance agency growing up, he could see the whole square. He says he used to pretend to be a mannequin in the window as he watched cars drive by or caught a parade moving through. Visiting his family’s business at the time meant playing hide and seek between the ling cabinets and posing for passers-by, but now, it’s his life. Owen’s family began Bagley & Bagley insurance in 1907, beginning with Owen’s great grandfather, Thomas Owen Bagley, and his brothers. In the century since its founding, the business has passed to Owen’s grandfather, Sam, and his father, David. Now Owen works with his father, aunt and rst cousin on the same square where it all started over 100 years prior. The Bagleys have seen Lincoln Country grow and thrive over the decades, including the formation of Lincoln Health System. Bagley & Bagley even contributed to the original donations that funded the hospital in 1917. Owen still remembers getting stitches at the old hospital before it became the modern health system it is today. Having served on the board of the LHS Foundation for six years, Bagley is now President of the organization, which raises funds for special projects and new assets for the hospital. A unique project the LHS Foundation made possible was purchasing a UTV for the sheriff’s department. The off-road vehicle can go where an ambulance can’t, enabling much easier access to people who are in need of emergency care but are located off the beaten path. They’ve also helped acquire a new ambulance and a new awning for the Patrick Rehab and Wellness Center, a part of the health system Bagley holds in high regard. Bagley is proud to be a Lincoln County native and for his family business to be a xture in the community. Having grown up in Fayetteville and later traveled to many other cities around North America, Bagley says he wouldn’t change a thing. Now that filing has become digital and Bagley has kids of his own, he doesn’t spend as much time people-watching from the windows of his family business, but Bagley & Bagley does own two buildings side-by-side on the same square he grew up visiting as a child. Just a few steps away from Honey’s — his favorite lunch spot — and never far from the people he loves.